As you may remember from last week’s blog, we talked about the many benefits of wood decks. If you have yet to read that article, Click Here. Among the primary benefits of wood decking are increased living space, durability, curb appeal, affordability, and, of course, a hefty return on investment: 87%, according to Remodeling Magazine’s annual Cost vs. Value Report. These are all benefits of a Low Maintenance Deck, as well. But these decks have one big advantage over wood. Any guesses? When it comes to choosing the right deck material for your home, it really comes down to preference. Some homeowners love the look and feel of a real wood deck. The aesthetic appeal is unmatched. Unfortunately, wood decks also require annual maintenance: staining and sealing. So if maintenance is not your thing, a low maintenance deck could be! Low maintenance decks are…well, they are low maintenance. The word “duh!” immediately comes to mind. These decks are designed to stand up to the elements, allowing them to maintain their beauty for years with – you guessed it – little to no maintenance. There is no need for painting, staining or sealing. Low maintenance decks naturally resist weathering, warping, and bugs. All you need to do is sit back, relax, and enjoy your new deck. 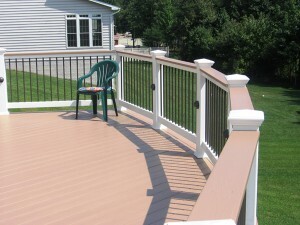 Mid Atlantic Deck and Fence Co. has been a deck builder in Maryland since 1987. And while it all started with wood decking, we offer low maintenance decking options as well. Stop in today to see our outdoor deck and porch displays firsthand. We will help you choose the right material for you, your home, and your budget. Then, we will help you design the perfect deck, making your dreams a reality. A well thought out and designed deck can really change the whole look and feel of your home and landscape. Mid Atlantic Deck and Fence Co. currently uses a 3D deck design software program to give you a better idea of how your new deck will look on your home. If you have any questions about Low Maintenance Deck Building in Maryland, please contact Mid Atlantic Deck & Fence (MAD Fence) today by clicking here or calling 1-800-833-9310. You can also follow us on Facebook and Twitter as well.